Following a 30 year career with the Space Shuttle Program, Pratt & Whitney Rocketdyne’s RS-25 engines are now preparing for their next role, with the Space Launch System (SLS). 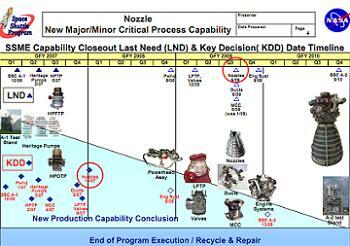 Tests involving the former Space Shuttle Main Engines (SSMEs) will begin at the Stennis Space Center in 2014. The SSME has provided safe flight for the Shuttle’s eight and a half minute ride to orbit since debuting with the Columbia during her launch in 1981. The engines proved their worth with only one major malfunction during its flight history, namely STS-51F (ME-1), resulting in a safe Abort To Orbit (ATO). The RS-25D is capable of achieving 400,000 lbs of thrust with an ISP of 453 seconds in a vacuum, or 363 seconds at sea level. The engines consist of over 50,000 parts and could be reused up to 20 times during their role with Shuttle. Following the decision to retire the Shuttle once the International Space Station had been assembled, the engines were set to live on with the Ares I Upper Stage. However, problems with the requirement for air-starting the engine for second stage flight altered NASA’s direction towards the J-2X. With no future role for the RS-25s, NASA’s Transition Control Board (TCB) – a body that was tasked with redirection of agency assets to the Constellation Program (CxP) – directed the shutdown of engine production capabilities in 2007. At the time it was determined that only four new engines would be required to satisfy the needs for the remaining Shuttle missions. 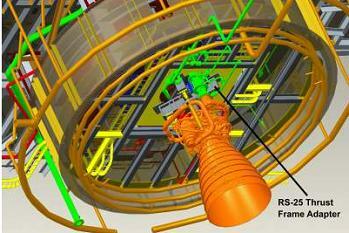 With the Constellation Program already struggling with budget and schedule concerns, a NASA Authorization Act in 2008 placed a temporary hold on the complete shutdown of RS-25 fabrication assets – mainly from the standpoint of spare hardware availability – as evaluations took place into short-term and long-term Shuttle extension possibilities. Thanks to the reusability of the SSMEs, only one additional “full engine” would have been required, had a two year extension – past its original 2010 end date – occurred during the evaluations. 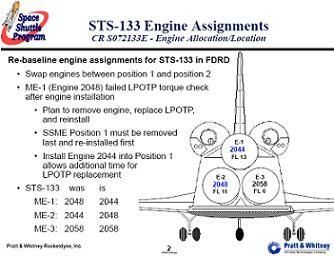 In the end, only the Contingency Logistic Flights (CLFs) of STS-133 and STS-134 – along with the addition of STS-135 – were added to the manifest. 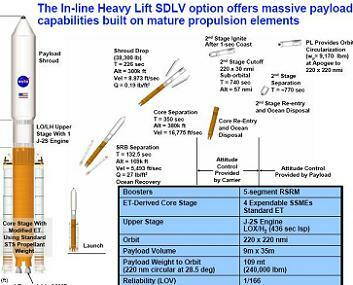 One lesser known option for continuing to use the RS-25s came during development of the Ares V Heavy Lift Launch Vehicle (HLV). The Ares V baseline consisted of a 10 meter core stage with six RS-68B engines, and two 5.5 segment solid boosters derived from the Ares I Program. However, with the Constellation Program looking for additional margin on lunar exploration missions – along with continued efforts to save money – managers returned to some of the original evaluations into the HLV via the ESAS (Exploration Systems Architecture Study) in 2005. The ESAS discussed a range of Cargo Launch Vehicles (CaLVs) during the early days of the Vision For Space Exploration (VSE), with CxP referencing that study as part of their interest in switching Ares V’s baseline towards an 8.4m core with five or six expendable SSME’s, two five segment SRBs, and two J2-S engines on the upper stage. The marriage between refining Ares V to a previous ESAS option also moved the vehicle closer to a more powerful HLV known as the “Magnum”, as outlined in the AIAA Joint Propulsion Conference Document from 2005. 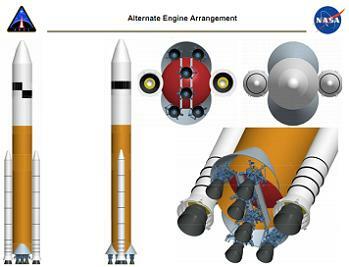 However, the Ares V discussions focused on the potential use of five or six RS-25Es – the expendable version of the SSME – on the core stage. 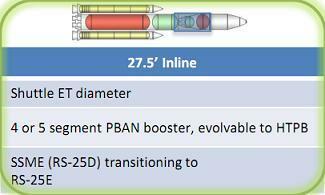 While the Ares V didn’t survive the cull of the Constellation Program, data from the potential switch to RS-25s on the HLV likely fed into the RAC (Requirements Analysis Cycle) effort that was tasked with finding the best baseline for the new Space Launch System (SLS) rocket – the HLV that is now the focal point of NASA’s latest Beyond Earth Orbit (BEO) drive. One key element of the Ares V study noted the the RS-25s may be better suited than RS-68s for mitigating the plume impingement and base heating issues that were an issue with the Ares V.
In a cluster of engines, the nozzle must withstand both the heat from its own exhaust in addition to the outside exhaust plumes of the other engines in the cluster. The study – available on L2 – noted that exhaust plumes of six RS-68 engines, combined with the two SRBs, interact to reduce the efficiency of the engines, and cause extreme heating on the base of the core stage. As such, the study claimed the regenerative nozzle of the RS-25 held an advantage over the ablative nozzle on the RS-68s, by providing more resilience, adding the regenerative nozzle protects both the inside and the outside of the nozzle, versus the ablative nozzle which is designed to deal with heat from only the inside. Numerous other factors saw the RS-25s selected as the engines for the SLS core stage, not least the law of the 2010 Authorization Act that ordered NASA to select a vehicle that used both Shuttle and former Constellation Program hardware, confirming the engines would live on in their new role after the Shuttle Program ended. All nine of the last SSMEs to fly with the Space Shuttle performed admirably, with Discovery flying Main Engine 1 (ME-1) – serial number 2044, ME-2 – 2048 and ME-3 – 2058 during her final mission, STS-133. For Endeavour’s swansong, ME-1 – 2059, ME-2 – 2061, and ME-3 – 2057 helped begin the flight phase of the successful STS-134 mission, while Atlantis closed out the Space Shuttle Program, flying with engines ME-1 – 2047, ME-2 – 2060 and ME-3 – 2045 during STS-135. A total of 15 RS-25Ds left the Kennedy Space Center (KSC) for their new role, arriving at the Stennis Space Center in 2012. While testing has been ongoing on the J-2X Upper Stage engine, Stennis engineers are now working on building and installing a new 7,755-pound thrust frame adapter for the A-1 Test Stand, in order to enable testing of the RS-25s ahead of their role on SLS’ core. The reason for the new adaptor relates to the requirement of different types of engines. On the test stand, the adapter is attached to the thrust measurement system, with the engine then attached to the adapter, which must hold the engine in place and absorb the thrust produced during a test, while allowing accurate measurement of the engine performance. The adaptor that is currently installed on the A-1 Test Stand is specific for the J-2X – an engine capable producing 294,000 pounds of thrust. It can’t be used for the RS-25, given that engine is much more powerful, with the ability to produce approximately 530,000 pounds of thrust. The design – produced by NASA, Lockheed Martin Test Operations Contract Group and Jacobs Technology – took several considerations into account, such as specific stresses on the equipment as an engine is fired and then gimbaled during a test. 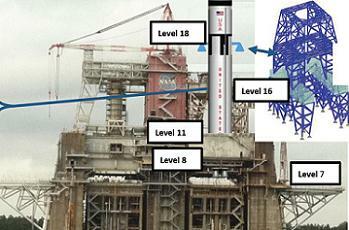 The installation is set to take place in November, once the Test Stand has completed J-2X gimbal testing. SLS will naturally evolve after the opening flights of the Block I SLS, with SSME contractor Pratt & Whitney Rocketdyne (PWR) set to produce RS-25E engines for the rest of the SLS’ lifetime. The RS-25E is expendable and thus requires less long-life hardware items, in turn making it cheaper to produce.